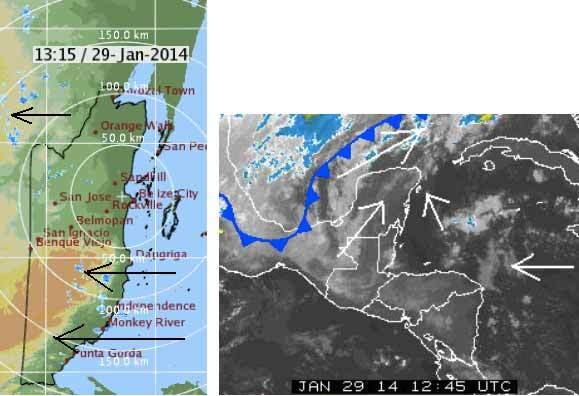 Belize NMS: Slight increase in moisture as a weak cold front approaches. Winds wills stay light and seas will remain relatively calm. 24-hour forecast: Cloudy at times today with a few showers mainly along southern coastal areas this morning and then mainly inland this afternoon. Cloudy tonight with a few showers and periods of rain mainly inland and in the north. Today: Winds: East 5-15 kts. ; seas: Light chop - choppy. ; waves: 2-4 ft.; a few showers mainly in the south and mostly in the morning. Tomorrow: Winds: N-NW 5-15 kts in the morning..Becoming e'ly in the afternoon. ; seas: Light chop - choppy. ; waves: 2-4 ft.; a few showers or periods of rain mainly north. Marine Outlook: Thursday night:- winds: N-NW 5-15 kts. ; seas: Light chop - choppy; waves: 2-4 ft.; a few showers or periods of rain mainly north. General Outlook: For Thursday and Thursday night is for cloudy and cool weather with a few showers or periods of rain mainly in the north. On Ambergris Caye this morning we have a breeze from the East at 8 mph. The expected high is 81 with a clear sky. Foggy morning due clear sky last night, moist Caribbean air coming in and being influenced by the approaching cool air. Looks like scattered rain showers, mainly in the South, but could be anywhere. . ...But I expect some sun when the fog has burnt off.